Endless Slideshow Screensaver is a free Windows 10 screensaver. It is 100% compatible with Windows 7, 8, XP, 2000, Vista, 10 and delivers 100% endless fun to your PC with just a few mouse clicks! So what is Endless Slideshow Screensaver? First of all - it's a free photo slideshow screensaver which allows to view photos from your PC in a beautiful slideshow with more than 200 astonishing transition effects. It supports all popular image formats such JPG, PNG, GIF, BMP and others, as well as camera RAW formats (CR2, NEF and others). But why is it endless? It has one unique feature: it automatically finds and downloads fresh desktop wallpapers from the Internet. You just have to select wallpaper categories you like and enjoy endless stream of new pictures delivered right to your desktop every time you run the screensaver! Currently there are more than 20 wallpaper categories available for you to choose from, including Nature, Cars, Space, Flowers, Celebrities, Sports, Games, Girls, Men, Animals and others. If Endless Slideshow Screensaver is not installed on your PC yet - use the above button to download installation package and follow several easy steps to install the screensaver. It downloads and installs in seconds. Once installation is complete you will see Windows Screen Saver Settings window with Endless Slideshow Screensaver preselected. Now click the [ Settings... ] button to open Endless Slideshow Screensaver configuration window. 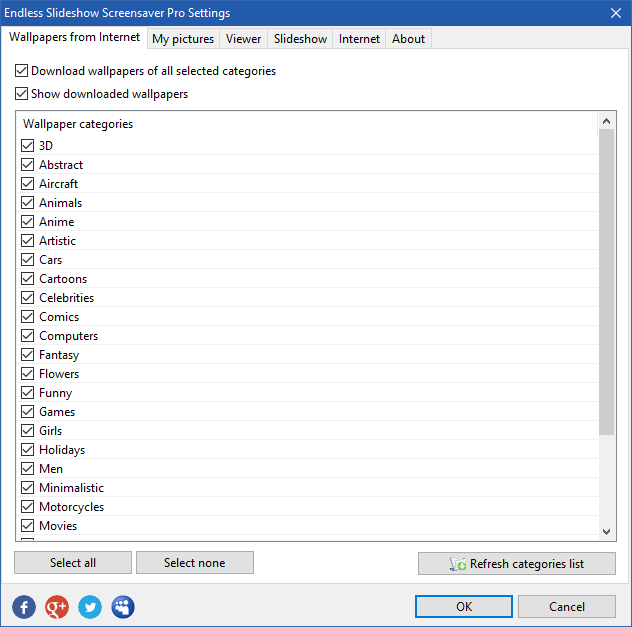 If the screensaver is already installed - you can use a shortcut in the Endless Slideshow Screensaver folder of Windows Start menu or on your desktop: Configure Endless Slideshow Screensaver. There is also shortcut to open the above window where you can configure auto-start interval: Open Windows Screensaver Settings. You can configure Windows to start the screensaver automatically after any period of inactivity. Simply use the Open Windows Screensaver Settings shortcut in Endless Slideshow Screensaver folder of Windows Start menu to open the screensaver configuration window shown above. If Endless Slideshow Screensaver is not selected - select in the list of available screensaver and set any number of minutes you like in the Wait field. And if you want to start Endless Slideshow Screensaver immediately - use one of shortcuts created by the installation package. One in the Windows Start menu and another one on your desktop: Start Endless Slideshow Screensaver.